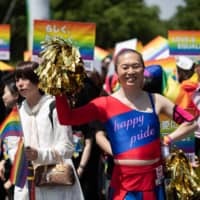 Panasonic Wild Knights on Saturday signaled their intentions to bring the Japan Rugby Top League trophy back to their clubhouse in Ota, Gunma Prefecture, as they beat Yamaha Jubilo 15-0 at Prince Chichibu Memorial Rugby Ground. 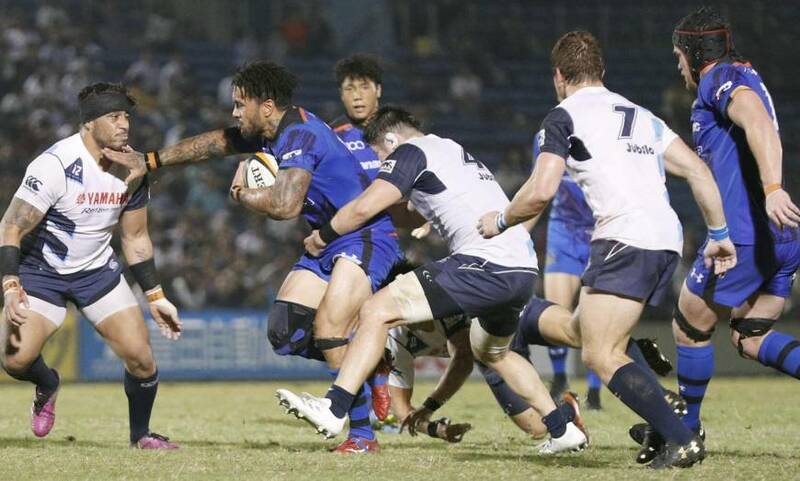 Having finished third and second the last two seasons, Robbie Deans’ side, which won the title three years running from 2014 to 2016, has started the new campaign with four straight wins, with flyhalf Takuya Yamasawa once again catching the eye. 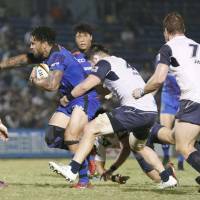 Up against an international-class openside flanker in South Africa’s Kwagga Smith, Yamasawa created one try and was steady with the boot and in defense as the Wild Knights handed Jubilo their first loss of the season. “I am very happy to arrive at this point of the competition with four wins,” said Deans, who will coach the World XV taking on Japan on Oct. 26. Yamaha head coach Katsuyuki Kiyomiya, meanwhile, was left to rue some simple handling errors. “We had our chances,” he said. The win sees Panasonic, which had both Kenki Fukuoka and Ben Gunter stretchered off the field with head injuries, lead the White Conference with 17 points, three more than Yamaha and the Ricoh Black Rams, who beat the Canon Eagles on Friday night. Shohei Toyoshima grabbed a brace of tries as the Toshiba Brave Lupus moved into fourth place on 11 points following a 29-14 defeat of the winless Coca-Cola Red Sparks, while a last-minute try and conversion from Gerhard van den Heever helped Kubota to a 31-29 win over the Honda Heat and ensured the Spears finish the weekend in fifth spot on 10 points. In the Red Conference, the Toyota Verblitz sit atop the standings following a thriller with the Kobe Kobelco Steelers. Four penalty goals and two conversions from Dan Carter looked to have given Kobe the win but Jamie Henry crossed eight minutes after the hooter to bring the sides level at 26-26. Lionel Cronje’s missed conversion saw both sides take home two points, putting the Verblitz on 13, one more than the Suntory Sungoliath, Toyota Industries Shuttles and NTT Communications Shining Arcs. Suntory beat the NEC Green Rockets 47-31 in a game that saw 12 tries scored, three of them by Suntory and Japan fullback Kotaro Matsushima. 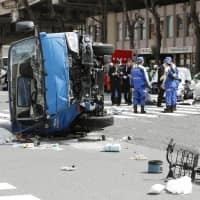 The Toyota Shuttles picked up their third win of the season by beating the Munakata Sanix Blues 32-15 thanks to a try, three conversions and two penalty goals from Sam Greene. The NTT Communications Shining Arcs, meanwhile, downed the Hino Red Dolphins 45-28 despite a 53rd-minute red card to Shane Gates, who had earlier scored two tries. Kobe, the only other side besides Panasonic not to have lost a game, is a further two points back in fifth spot having played one less game. On a balmy autumnal night in Tokyo, Yamasawa and Akihito Yamada started where they left off last week as Panasonic opened the scoring in the fourth minute with an 80-meter try as Yamada used his pace to back up Yamasawa’s superb soccer skills to score in the corner. Yamasawa, who turned 24 on Friday, and Ayumu Goromaru then spent much of the next 10 minutes or so playing aerial ping pong as both teams tried to force their opponents into making a mistake. And it was Jubilo who cracked first, allowing Yamasawa to increase the lead with a penalty in the 18th minute. Four minutes later, Yamada’s speed and Sam Wykes’ basketball skills combined for the Wild Knights’ second try as the wing pounced on a loose ball and then saw his pass caught by the lock behind his back before he dived over. Yamasawa’s conversion ensured the teams turned around with Panasonic leading 15-0. 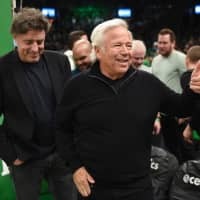 The second half was an even tighter affair than the first and with neither defense yielding in a bruising encounter, the scoreboard operator was not called into action.